“Perhaps the biggest factor of them all is the market rally. The Dow Jones Industrial Average is up 12.7% in the last six months, 17.5% in the last two years and 97% from the crisis-era low in March 2009. The recovery of wealth, leaving the market roughly where it was at the end of 2007, isn’t insignificant. Seventy-four percent of Americans who have yet to retire expect to tap funds they have in 401(k)s and other savings plans, while 40% will primarily use money invested in stocks and mutual funds. Even among those already retired, 30% draw most of their income from market sources, according to Gallup. It’s only natural that people are feeling richer and less afraid. Reform Wall Street? Why spoil the party? Tally all of it up and you have a populace softened by a market rally, distracted by home economics and lawmakers worn down by a record $474.1 million spent last year on lobbying by the insurance, real-estate, banking and securities industries. Meanwhile, some of the protagonists are gone. Sen. Chris Dodd and Rep. Barney Frank have left the building. They both decided against running for new terms. Of course, a 97% recovery of stock market values, and return to 2007 heights, is not reflected in a 97% recovery of anything else. The unemployment rate remains 4% above where it was in 2007, and the upper 1% captured 93% of the growth during this ‘recovery.’ Why persistent high levels of unemployment, alongside stagnant wages and benefits, and and even more unequal ‘growth’ have not produced more social protest is still a mystery. Powerful Wall Street lobbyists can explain some regulatory changes (that’s the WSJ’s view), but not social passivity (very few Occupiers were retirees who had lost their 401(k)s…). It is conceivable that even very modest job gains are enough to give many hope that a recovery for everyone else is on the way. And that kind of hope might make many unwilling to rock the boat. But one suspects it has more to do with desperation mixed with the absence of a party or movement able to represent popular interests in a robust and sustained way. The recent piece that Aziz and I published at Salon.com was a thought piece. Its purpose was to start a conversation about how to organize an economy in which each participant has the possibility of enjoying equal independence. We called this the ‘Lincoln’ vision, and contrasted it with the current meritocratic approach to equal opportunity, which we likened toJefferson’s notion of a ‘natural aristocracy’ (itself taken from James Harrington). On the latter view, there are a few talented individuals, and the primary purpose of an economy is to sort these few from the less talented many. The natural aristocracy is entitled to scarce positions of social and political power because of their purported virtue, a virtue supposedly established by their ability to win an economic rat-race. This is equal opportunity to become radically unequal, and in which most to end up enjoying little real freedom in their daily, economic lives. It is an unattractive ideal in its own terms, and has, anyhow, given some actual facts about theUnited States, become a dead letter. The attraction of the view we associated with Lincoln is that it presented the economic order with a different task. Its purpose was to make available to all the possibility of economic independence, a condition understood as control over work activity, not just ability to sell one’s labor. Lincoln called this truly free labor, and contrasted it not just with slavery but with wage-labor too (or at least with being a permanent wage-laborer). The overall emphasis is not on selecting the talented few but on freedom for all. Lincoln himself, of course, was limited by a somewhat agrarian vision of what free labor would look like – an individuated condition of personal autonomy. Each individual owned a small share of the ownership of the means of production – land. We live on the other end of the industrial revolution, and any translation of this conception of economic independence has to take account of the collective character and scale of most work. But to get to that conversation, we first thought it necessary to draw the general contrast between the inegalitarian, meritocratic view of equal opportunity, whose purpose is to generate a ‘natural aristocracy’, with another view whose aim is to secure the equal freedom of all. More than one commenter has argued we are proposing to replace ‘equality of opportunity’ with ‘equality of outcomes.’ First, this forgets the basic factual point that ‘equality of opportunity’ never existed, we did not replace it with anything, and even if you think it at one point existed, it certainly does not exist in any reasonable measure in the United States at present. The gap between the rewards to positions for those ‘natural aristocrats’ and the rest has widened radically, and this economy is creating two kinds of jobs – a few very high paying, high status positions that come with significant amounts of power and influence, and the rest fairly crappy ones. As we noted, in this supposed knowledge economy, “according to the Bureau of Labor Statistics, of the 20 occupations projected to grow rapidly over next decade, just five require an associate’s degree or more. Just two require a doctorate or professional degree.” And everyone knows the direction of the wealth and income statistics. But more than that the distinction between ‘equality of opportunity’ and ‘equality of outcomes’ is too vague to be meaningful. What is meant by opportunity or outcomes here? Even on current ‘meritocratic’ interpretations, equality of opportunity requires equality of certain outcomes. Minimally, certain laws must be in place, from equal civil rights to anti-discrimination statutes. More, everyone must have a certain level of educational achievement, range of skills, amount of mobility, and access to certain basic social goods; otherwise they won’t be able to compete for the available opportunities. Lack of education leaves individuals unqualified; lack of basic social goods makes individuals unable to take the risks, or at least not feel the pressure of the labor market so intensely that they cannot wait for something better to come up. If the relevant opportunities include something like starting a business, then some access to capital is necessary. But all of these preconditions – education, welfare, access to capital – are ‘outcomes.’ They are conditions that individuals have to actually achieve before we can say they enjoy anything like equality of opportunity. But those achievements or outcomes are not conditions that create themselves. They have to be maintained by social policy. So even on its own terms, the quest for equal opportunity is not the opposite of equal outcomes. Of course, the opportunities for economic freedom that we were talking about would require more radical economic reorganization than all that – the creation of a much different set of opportunities, of transformed work and economic structures. But that is not replacing ‘opportunities’ with ‘outcomes,’ it is an argument for the creation of different kinds of opportunities. The vagueness in the contrast between ‘outcomes’ and ‘opportunity’ is not a product of lazy thinking, it is purposeful. Its rhetorical purpose is to associate any attempt to intervene in or manage an economy, especially redistribute property, with ‘outcomes’, and thus with unjust, authoritarian coercion. The thought is that all attempts to give people at work a say in the conditions of their own employment means the repudiation of “excellence” and “innovation” by the talented few. Such a view implies that equal opportunity is about individual “free choice” – where those that succeed were the “innovators” – even if the range of individual free choices is nominal, radically unequal, and indifferent to the resulting distribution of social and political power. It is a conservative talking point whose function is to redirect a serious discussion even of the minimal ideal the United States claims to uphold. Other critics were unhappy with our use of Lincoln and Jefferson, but mainly Jefferson. Let it first be said that our purpose was not to give an exhaustive interpretation of Jefferson, Lincoln and the differences between them. It was heuristic, to present two different ideals, one which saw the economy organized to reward those deemed fit to rule, and another whose purpose was to create conditions in which everyone could enjoy economic independence. We called one inegalitarian and the other egalitarian, but are well aware that the specific individuals can be found making other kinds of statements. Lincoln himself, even in the very speech we quote, pairs his egalitarian vision of an economy that makes equal independence for all possible, with the idea that people will fail because of their own lack of virtue. Some post-Civil War liberals used this idea to blame the working class for its poverty. These liberals made the deeply troubling jump of blaming individuals for outcomes that were the product of economic structure – a structure that, anyhow, in agrarian Wisconsinin 1859 (where Lincoln gave his speech), was not nearly as vivid as it would later become. Perhaps there is a further problem. As one of our critics argued, Lincoln appears to assume the existence of a working class – “the prudent penniless beggar” – who rises through hard work. This is a vision of interclass social mobility, but there is no social mobility among classes unless we first assume class. So Lincoln is spouting mere class ideology. Here again, the criticism too quickly reads the vagaries of industrial society backwards. In fact, it is a reproduction of an ideological victory. That ideological victory is the one that wipes out alternatives that existed in the past, but were defeated. Permanent wage-labor and industrialization had developed in parts of the US northeast, but it was post-bellum America that saw explosive industrialization. In those social conditions, a particular assumption about the necessity and permanence of a working class became widespread, and was dressed up in the language of the nominal freedom of each ‘free laborer’ in contrast to the unfreedom of former slaves. In the minds of newly mobilized industrial workers, their nominal freedom paled in comparison to the old Lincolnian ideal of economic independence. It also meant that such independence could not be achieved through a self-regulating commercial society or on laissez-faire grounds; independence would require a dramatic rethinking of economic relations. This is why so-called “labor republicans” called for the creation of a cooperative commonwealth as the key instrument for fulfilling long-standing goals of equal freedom. Importantly, for Lincoln, although it may have been a tenuous position even on the eve of the Civil War, he still assumed that economic independence was perfectly compatible with small-scale capitalism (of homesteading, shop owning, and even petty manufacturing). Unlike later post-war liberals he was not forced to confront as fully the incompatibility between the goal of independence and the limitations of free market relations. Still, for our purposes, the important point is that regardless of his conclusions about the market, Lincoln nonetheless was still working with a vision of economic independence as the goal of an economy, a vision very different that the meritocratic one today. Indeed, this ideal of independence entailed truly radical possibilities – possibilities which became central to the labor movement – precisely because it had not been stamped by the later Gilded Age view that freedom only consisted in the legal self-ownership of the penniless worker. Even for Lincoln, whatever his profound limitations, freedom carried with it the belief that an economy ought to make possible the equal independence of all workers. That is freedom for all, not power and prestige for some, and it is worth recovering and adapting to our present conditions. Zizek’s main piece of evidence in favor his his “post-industrial” analysis of this ‘information economy’ is that “any attempt now to link the rise and fall in the price of oil to the rise or fall in production costs or the price of exploited labour would be meaningless: production costs are negligible as a proportion of the price we pay for oil, a price which is really the rent the resource’s owners can command thanks to its limited supply.” But this is a silly argument. For one, it is Marxist economics 101 that value and price diverge. Moreover, all Zizek is really talking about is monopoly rents, which just about any economic theory can grasp, and which disproves none. Finally, any anti-sweatshop campaign can tell us that labor costs “are negligible as a proportion of” the final price of, say, a $30 Nike cap. There is little monopoly rent there. More problematic, Zizek’s further point is that we can understand recent protests as the political activity of the “salaried bourgeoisie,” a strata of professionals and managers, whose salaries are paid by the rent-receiver, but who now feel the austerity squeeze. These are not a ‘revolutionary subject’ because they are indifferent to the plight of the real 99%, the globally jobless, the post-proletarians, who don’t even have the right to work. In his rush to join the time-servers and declare a new era of informational capitalism, based on information and creativity on the one hand, and mass joblessness on the other, Zizek has missed the chance to make a potentially valid point in a more serious way. It is certainly true that the Occupy/Indignado phenomenon has a touch of the petty bourgeois element to it. In fact, as others like Jodi Dean have argued quite powerfully, this class element seems to be inscribed into the politics of Occupy itself: “The refusal to be represented by demands is actually the refusal or inability to make an honest assessment of the social composition of the movement so as to develop a politics in which different forces and perspectives do not simply neutralize each other.” This political analysis is available to us without having to trot out trite nostrums about the new economy. Moreover, if there really is something new under the sun in the realm of surplus extraction, it probably has more to do with the development of debt and finance over the past thirty or forty years, not the (fake) disappearance of industrial production. The piles of debt under which so many workers sit represent yet another claim on their labor time. It is not just lower wages, but that a substantial amount of what they get paid is not theirs to control. They are paid less than what they produce, and then a further chunk of their means of subsistence is siphoned off. To be sure, debt burdens are a long-standing feature of the capitalist economy, and one should not overstate the novelty of the situation. Capitalism is an extremely dynamic economic system, and it is easy to get caught up in the dynamism and believe that everything has changed. But if we are looking for the distinctive features of surplus extraction in the present, it won’t be found in the heady, but superficial, claims that we have entered an informational age in which surplus is extracted through ‘rents.’ More promising is the attempt to grasp the role of debt and finance, not as replacing, but overlapping with the regular old wage-contract. 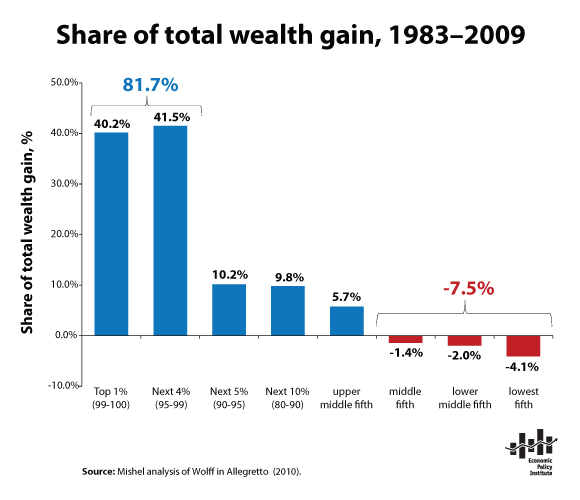 Recently, the Economic Policy Institute published “11 Telling Charts from 2011,” including the following one showing the share that different segments of the US Population took of the wealth gain from 1983-2009. When we first looked at this chart, we started reading from the left and adding the numbers but did a double take by the time we added the Top 1%, Next 4%, Next 5%, and Next 10% – or the top 20%. Add their shares together and you get 101.7%. At first that just didn’t seem right, since our assumption was that when you add up all the shares one would get 100%. Naively, we had assumed that, while radically unequal, the gain in wealth for all quintiles would positive. A piece of folk philosophy in the United States is that the rich can gain huge gobs of money and power, so long as the poorest can also have some piece; and that those who rise do so on their own merits, but not by making the worst off even worse off. That, as it turns out, is also a premise of the most influential theory of justice in contemporary political philosophy, which states that the only permissible inequalities are those that make the worst off better off than they otherwise would be under pure equality. The past twenty-five years have followed a different path from mainstream, common sense theories of justice. The worst have been made worse off. Meanwhile, the massive gains of the top 20% were only as large as they were because wealth was redistributed from the poor to the rich (with very moderate gains for the top 20-40%). The expropriated were expropriated some more. These figures are even more important than the income inequality statistics with which everyone is now familiar, because those income statistics alone give the impression that, at the very least, nobody is being made worse off. In addition, wealth is a much better indicator of social and economic power than income, as it shapes individual bargaining power, determines who controls investment, and establishes the distinction between those who are economically secure enough not to have to work, and those who aren’t. Looking at the graph again, a key political point emerges, which we have made before: the problem is not with the 1% alone. The expropriators area larger class than that. 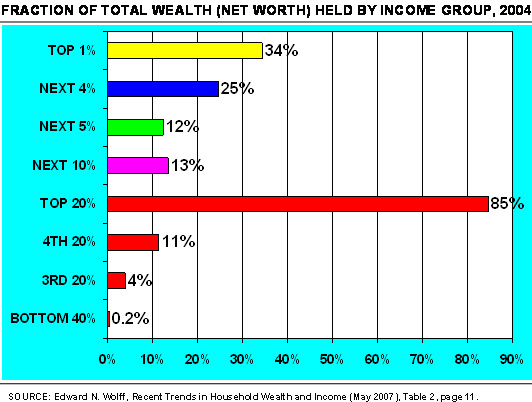 After all, the next 4% took just as large a share of the total wealth increase, and overall, the top 20% are doing quite well. To reuse a chart we have used before, the top 20% control 85% of the total wealth in the United States, and if residential wealth were removed (at least, value of primary homes), that would undoubtedly rise much higher. So the current political obsession with the 1% introduces a very problematic distortion into the actual dynamics of class, and the real distribution of wealth and power, in the current political economy. We are the 99% has a wonderful, quasi-universalist ring, but actually real distinctions under the rug, and implicitly dodges hard conversations about the real class composition of the United States. A real critique would have to reach beyond mere populism. The issue of demands continues to surface (and die) at the Occupations, with a recent casualty being a ‘jobs for all’ platform proposed at Occupy Wall Street. Media coverage has obsessed about the lack of demands, yet it has missed the fact that a number of General Assemblies have approved one: end corporate personhood. As far as we can gather, this is the one point on which the OWS and the Occupy Boston groups have agreed on, and at our various discussions at Occupy Boston in particular, it is the one demand we find nearly everyone there actively supporting. Although we addressed the corporate personhood issue before, it is worth revisiting given its emergence as something of a consensus position. At a tactical level calling for an end to corporate personhood, especially while rejecting most other demands, is just politically tone deaf. For one, why would a movement claiming to represent the interests of 99% begin with such a technical and dislocated demand? It is hardly high on the list of the many groups and persons who are suffering from the current economic order and who might very well tacitly support the Occupations. While Occupy enjoys a fair, though unmeasurable, amount of tacit popular support, at some point it will have to convert at least some of that support into active support. To do that, it will have to show political insight into the needs and desires of those potential supporters – workers, debt-burdened consumers, immigrants. Corporate personhood is hardly high on their list, and it is certainly not the main obstacle to meeting their demands. Moreover, the demand to end corporate personhood is a tactical mistake because it is so middling and indeterminate. It seeks to tear down some aspect of the present, but does not even hint at the ultimate structure of ownership, scale of production, and justice of distribution that a more desirable economic order would have. Ending corporate personhood is neither a broad and radical desire, like a demand to create jobs for all or demand to nationalize banks and socialize investment, nor is it a concrete demand, like a millionaire’s tax and suspension of foreclosures. In other words, it does not seem to offer either a utopian vision nor any immediate improvement in the majority’s economic situation. The demand speaks to a kind of poverty of imagination and, at a more mundane level, betrays an odd unwillingness to think about the immediate concerns of the 99%. Of course, we know why the idea of ‘corporate personhood’ has seized the Occupiers’ imagination. In the Citizens United case, the Supreme Court used the idea of corporate personhood to defend the free speech rights of corporations and to undermine federal limits on campaign contributions and political ads by corporations and unions. Further, Citizens United was decided against the background of Kelo v. City of New London. That case expanded the legitimate use of eminent domain to allow the state to force property owners to sell their land to the government for the purposes of having that land resold to private development corporations (rather than be put to use by the state itself). If the corruption of democracy is generally associated with corporations and concentrated wealth, these cases have made corporate personhood the special object of contempt. Citizens and Kelo were both bad cases, but they were not bad cases because of the very idea of corporate personhood. They were bad cases because they constructed the legal personality of corporations in bad, undemocratic ways. There is nothing inherent in the very idea of a corporate person that leads to undemocratic outcomes. As we pointed out in our previous post on corporations, a corporation is a collective economic entity with certain powers, rights, and liabilities. These features of its legal ‘personality’ are artifacts of law. The undesirable legal changes to corporate governance – by judges and legislators – are a sign that democracy was already corrupted well before the expansion of certain corporate powers. Under conditions of real democracy, we might construct this legal personality in ways that were more suited to serving the public interest. In fact, there are elements of corporate personality that still bear the traces of democratic control. In many civil cases, corporations are subject to ‘strict liability.’ That means they are economically liable for the harm some decision they make causes, even if they did not intend harm others and could not have known of the consequence. This is not the kind of liability to which an individual person can normally be held. (An individual generally is liable only if some kind of intent – even if only at the minimal level of negligence – is present.) Part of the reason for this difference in liability is to acknowledge the greater social power that corporations have, and to impose a discipline on them given the risks they take. Knowing they face strict liability, and the prospect of massive damages from hostile juries, forces a degree of self-supervision of corporate activities. Civil lawsuits might not be the best way to deal with the unequal social power of corporations. But the point is that the lower standards of intent that corporations face is a feature of how lawmakers have constructed their legal personhood. That corporations have legal personality is what makes that personality subject to democratic control.